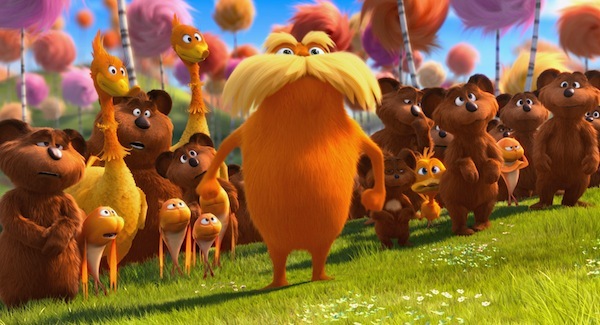 The little fuzzy ball of orange love, The Lorax, the keeper of the trees, saw green opening weekend with a stunning $70.1 million in box office returns. The Lorax breaks the record for feature film openings this year with an estimated $70.1 million at the box office, giving it the number one spot by a long shot, according to The Wrap. Looks like thinking green also means raking in the green for this little idea that could. Trailing way behind in the number two spot for this week’s box office top 10 is Project X, the story of three high school students who throw the ultimate in rocking parties. It earned an estimated $20.8 million. Last week’s number one, Act of Valor, the story of Navy SEALs who rescue a female CIA agent, drops to third place with an estimated $13.7 million in box office returns. Holding strong in the top ten is Denzel Washington’s Safe House, the movie about a cop and a criminal who play cat and mouse on a chase that keeps the audience guessing about who’s the real bad guy. It grossed an estimated $7.2 million, which gave the film a ranking of fourth place this week. Coming in fifth with an estimated $7 million is Tyler Perry’s Good Deeds. The film underperformed compared to some of Perry’s other family dramas, but still held on with a steady following of those who love his movies despite the absence of a strong role from the Madea character. The Rock’s fun-filled Journey 2: The Mysterious Island kept family crowds interested with $6.9 million in box office returns, bringing it in at sixth place. And that isn’t the only movie that just keeps on giving. The romantic drama starring Channing Tatum and Rachel McAdams, The Vow, held strong with seventh place, earning an estimated $6.1 million. The Valentine’s Day number one has been giving audiences a thrill since it debuted several weeks ago. Reese Witherspoon’s action comedy This Means War maintained a small following with $5.6 million, ranking the film in eighth place. Nicolas Cage’s Ghost Rider: Spirit of Vengeance took ninth with $4.7 million and Oscar-winner The Artist resurged into tenth place with $3.9 million.